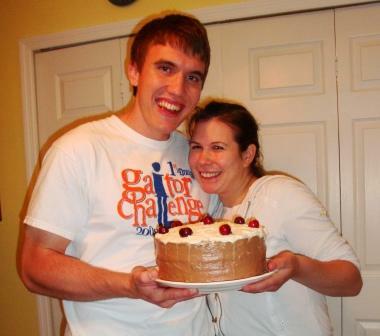 Ben enjoys cooking, as you can see in this photo of Ben and Bonnie with a Black Forest Cake. Last month, his church had a cookie contest and the Bible study group he’s in made over 200 cookies and entered three cookie recipes. All three won. When he gives me the recipe for the White Chocolate Macadamia cookies, I’ll add it here. Follow this link for the Pumpkin cookie recipe and for a photo of Ben and his Bible study friends. They struck this pose last May at the wedding of one of the guys from their group. Ben is second from the right. And speaking of weddings… Stay tuned for our next post! (There’s a hint on this page).